One day a bunch of us, adults and kids, were hanging out for a bit after yoga class. As the kids played I divulged that soon I’ll be lying on the beach for a week’s holidays. I mimed building sand castles and swimming in the ocean and my three year old friend who was listening started to pretend to play in the sand along with me. As the adults talked she built a big imaginary sand castle on the floor in front of us and then told us to look. 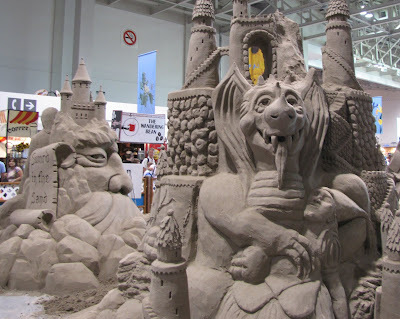 We admired her invisible creation, then with a swift and mighty kick through thin air, she knocked the sand castle down. Then she looked at us to see our reaction. We were shocked that her little defiant personality existed in both her real and imaginary worlds. Her negative thoughts ruled all her worlds. “Your circumstances do not make you. Often we try to change by changing our circumstances. But like my three year old comrade, if we don’t change our negative thoughts to a new way of thinking, we’ll keep kicking down our castles. This realization comes in handy when working with kids, especially three year old children. They don’t want to change who they are. If you try to change them, and start thinking negatively, teaching a class is difficult. Thinking about your own approach to the class is the only real option and you’ll probably find this method easiest. Here’s an inspiring talk called Vaccination Against Negative Thoughts with Tulshi Sen. He looks at why we dream and what ends up happening when we imagine. I found it inspiring. Enjoy!